Historically, the Alps have always played an emblematic role, being one of the largest continuous natural areas in Europe. With its numerous habitats, the mountain system is easily one of the richest biodiversity hotspots in Europe. Lichens are curious organisms comprising a stable symbiosis between a fungus and one or more photosynthetic organisms, for example green algae and/or cyanobacteria. Once the symbiosis is established, the new composite organism starts to function as a whole new one, which can now convert sunlight into essential nutrients and resist ultraviolet light at the same time. Being able to grow on a wide range of surfaces – from tree bark to soil and rock, lichens are extremely useful as biomonitors of air quality, forest health and climate change. Nevertheless, while the Alps are one of the best studied parts of the world in terms of their biogeography, no overview of the Alpine lichens had been provided up until recently, when an international team of lichenologists, led by Prof. Pier Luigi Nimis, University of Trieste, Italy, concluded their 15-year study with a publication in the open access journal MycoKeys. 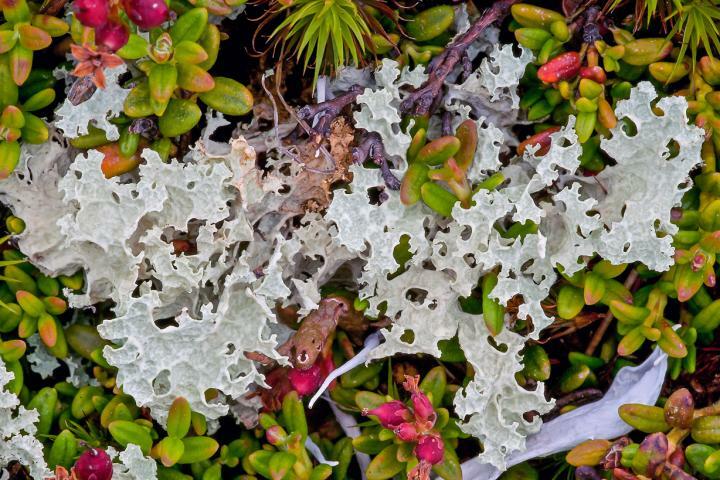 The scientists' joint efforts produced the first ever checklist to provide a complete critical catalogue of all lichens hitherto reported from the Alps. It comprises a total of 3,138 entries, based on data collected from eight countries – Austria, France, Germany, Italy, Liechtenstein, Monaco, Slovenia and Switzerland. In their research paper, the authors have also included notes on the lichens' ecology and taxonomy. They point out that such catalogue has been missing for far too long, hampering research all over the world. The scientists point out that this has been "particularly annoying", since the data from the Alps could have been extremely useful for comparisons between mountainous lichen populations from around the globe. It turns out that many lichens originally described from the Alps have been later identified in other parts of the world. "It was a long and painstaking work, which lasted almost 15 years, revealing a surprisingly high number of yet to be resolved taxonomic problems that will hopefully trigger further research in the coming years," say the authors. "We think that the best criterion to judge whether a checklist has accomplished its task for the scientific community is the speed of it becoming outdated," they conclude paradoxically. The new checklist is expected to serve as a valuable tool for retrieving and accessing the enormous amount of information on the lichens of the Alps that has accumulated over centuries of research. It offers a basis for specimen revisions, critical re-appraisal of poorly-known species and further exploration of under-explored areas. Thus, it could become a catalyst for new, more intensive investigations and turn into a benchmark for comparisons between mountains systems worldwide.